If Shortest Trip is telling you one thing, it’s that space is a pretty terrible place. There are asteroids to avoid, giant space worms looking for their next meal, even a race of rat people trying to burn holes in that metal tube you call a spaceship. The space faring survival game, currently in early access on steam, is all about getting your crew of poor saps out of the coldest depths of space back to the warm embrace of, you guessed it, Earth. between planets looking for resources. Finding their way back to earth requires your crew to warp between star systems using up what limited resources they have. Your crew will spend their time in most systems looking for additional resources; in particular the search for fuel seems like the never ending priority. Resources can be found in most systems through mining planets, bargaining with traders, or through other random events. But space isn’t as empty as your crew may hope and often they will encounter opposing spaceships resulting in a battle that may result in new modules that can be fitted into your ship. Or typically in my case, a game over screen requiring a restart from square one. It’s combat where Shortest Trip shines. Combat mostly requires you to direct individual crew members to manage ship modules like shields, weapons, sensors and so on. But mostly, your crew will be busy running around the ship fixing whatever mounting damage they can before their only way home comes apart. Considering that you mostly issue these orders in real time while choosing enemy ship modules to target and how to divide the ship's energy among your own modules, and you get what the game play is like. The hectic nature of the game play always feels like things are a moment from going terribly wrong. In other words, it’s exactly what you think space combat should feel like. It’s ultimately a blast that will keep you coming back for more punishment. But wait a second, this is all starting to sound a little familiar isn't it. Of course it does, Shortest Trip is strikingly similar to FTL released almost six years ago right down to the colorful graphics. 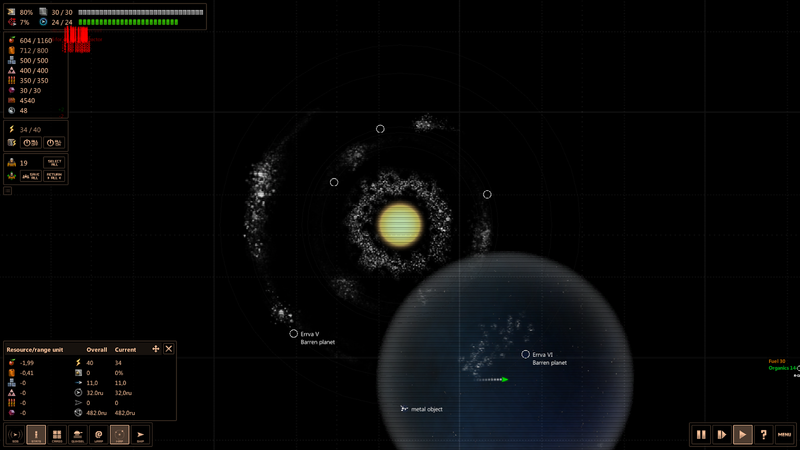 A game that is also about the realtime management of a spaceship crew as they venture through space. FTL is a good game; a very good game. 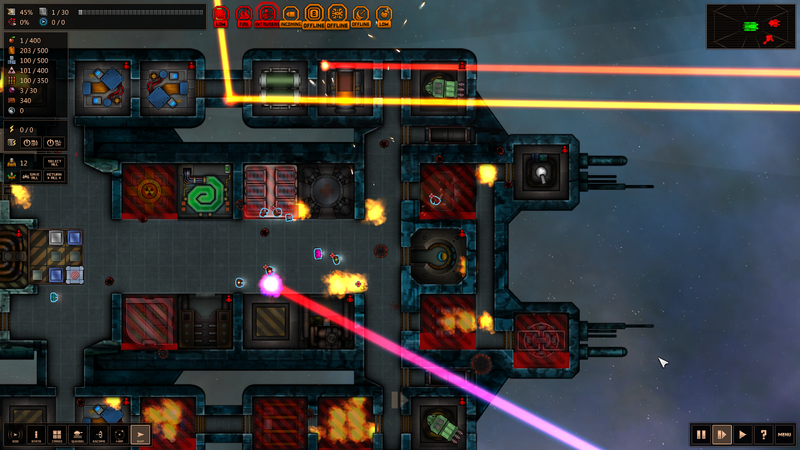 So, I won’t necessarily complain about the developers borrowing heavily from FTL. And besides, maybe after six years fans of FTL are ready to see what can be added to the formula FTL seemed to help perfect. Even patching holes require the right resources. What Shortest Trip does add to FTL’s formula is mostly complexity. For example, instead of just fuel, you will now have to manage multiple resources. 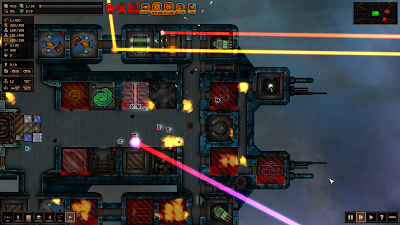 Your crew will require food (imagine that) and raw materials to patch up holes in the ship. 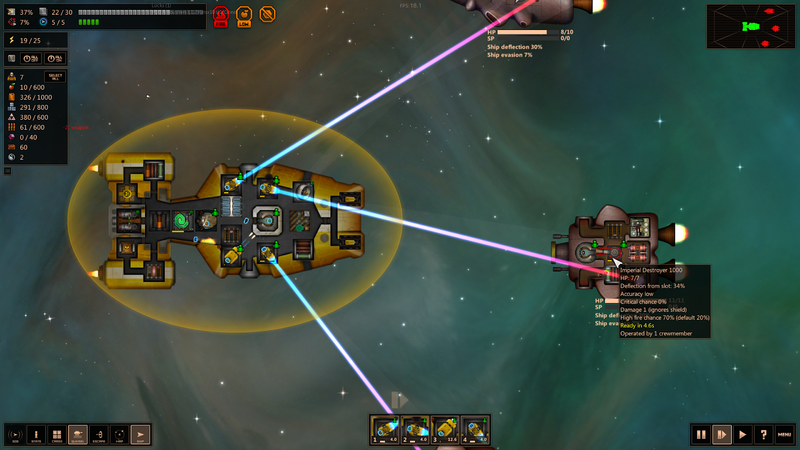 Combat can involve fending off multiple ships at once. Planets in star systems can be explored in a non-linear fashion. Crew members and ship modules come with numerous stats to obsess over. Good or bad, these additions tend to make the overall experience an even more difficult one than FTL ever was. If you played FTL to death and are looking for more, or just want to try your hand a managing a spaceship with all odds against you, Shortest Trip is definitely worth a try. But is it worth purchasing during early access? The multitude of star systems are divided among ten levels with only the first five levels currently available. The last five levels as well as additional ships, modules, weapons, crew, and so on are promised as the game approaches release in January. That being said, there is still plenty of content to keep a wanna be captain busy for some time. If you plan to wait for a full release, I do plan to revisit game during that time to see what's new. If you want to begin your trip back to Earth, head onto steam to purchase Shortest Trip.